Like this other festival, this festival also has a historical background. According to a story related to this festival, Goddess Durga killed Asur Mahishasur. Mahishasur received a boon he cannot be killed by any male or god, and he started misusing his power. Mahishasur teased all the gods. With his power, he expanded the hell to the door of heaven, so that the gods became frightened. Mahishasur took control of heaven and all the gods had to go away from the earth to heaven. Mahishasur's action led to all the gods being angry and then all the gods together formed the Goddess Durga. To destroy Mahishasura, all the Gods gave their weapons to the Goddess Durga, Goddess Durga became powerful. Nine days there was a war between Goddess Durga and Mahishasur and in the end, Goddess Durga ended Mahishasura. 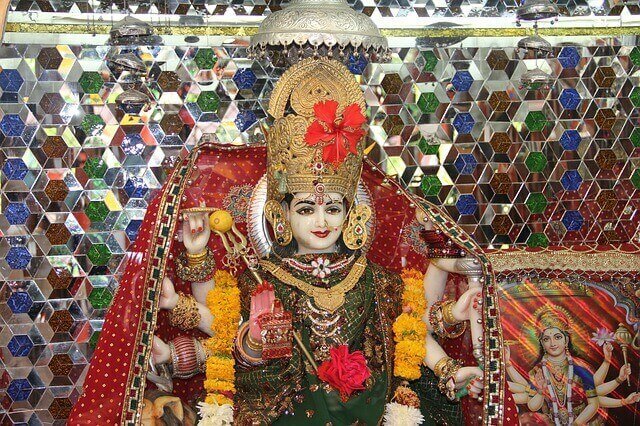 Navaratri is a Sanskrit word, Navaratri is a Hindu festival, which means nine nights. This festival comes twice a year. One is the monarchy Navratri, the second is Chaitra Navaratri. In nine nights of Navratri, there are three Hindu Goddesses - Parvati, Lakshmi, and Saraswati, nine forms of worship, which are called Navdurga. Mata Navadurga gives infinite Siddhis and Kali is the first major in ten major faculties. In ten powers of Lord Shiva, many of the ten modes of forming a variety of forms in the fiery and gentle, two forms are capable of providing infinite Siddhis. In these nine days taboos, meat-feeding and female contamination are considered barbaric. In these nine days, special attention is given for purity and purity. All the practices and motivations performed in these nine days are accomplished by meditation and devotion. Dishonesty and mourning are produced from impurity. Today's Garba dance has been completely traditional, in which the nature of politics is minimal or unequal. You can also see its commercial nature. Before independence, the Nawabs ruled Gujarat, at that time Garba used to have the glory of Gujarat only. But after independence when the people of Gujarat got out of their state and made their residences in other places, gradually the garba was also organized at other places. The connections of Garba and Navaratri are many years old from today. Previously it was played only at traditional places like Gujarat and Rajasthan, but gradually it was accepted by many countries of the world, including the whole of India. The significance of garba is not only religious but also associated with politics and literature. Brahma, Vishnu, Mahesh, the whole universe revolves around this trinity of the gods. The invocation of these three gods is called the power. To worship God in Hindu religion, hymns and Aarti are performed, which is not only read but also sung with music and instrumental instruments. Garba full of devotion is also a medium of rhythm and devotion to the devotion of mother Amba. The people of Gujarat believe that this dance mother is very dear to Amba, so Garba is organized to please her. Another perspective on the symbolic form of Garba is that as soon as the dancers revolve around the circle of circular movements with their hands and feet, it reflects the cycle of life, which goes from life to death until it is reborn. In Garba dance, women also use clap, pinch, dandiya, and manjirs. For giving rhythm, women give different rhythms in groups of two or four. During this time songs related to Goddess Shakti and Krishna's Raslila are sung.